Riley update: He came off IV bute today (Wed). They called late in the day and said he was uncomfortable in the am, but seemed to be doing better. The surgery site was inspected by a senior vet who pronounced it to be healthy healing. Welcome to the highlight of my vacation! I attended the Hanoverian inspection at Rolling Stone Farm on August 4. I have been to about 5-6 inspections in PA and MD in the last few years, and I have to say this one really wow'ed me. A number of mares did their performance testing and several were named elite mare candidates/eligible. One Dutch mare got a 9 on her gaits, which is a rare thing. Let's face it -- the real stars of the show were the babies. The Rolling Stone babies were all really lovely, big movers with gorgeous heads and necks. Both Rolling Stone Farm and Triad Hanoverians both had a fabulous crop, and Triad Farms babies had a double whammy of big movement and chrome-o-rama. 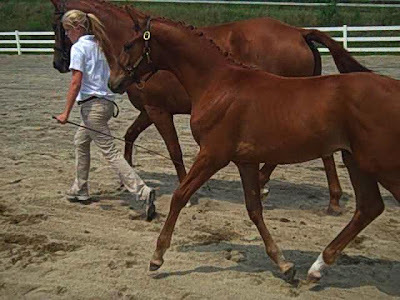 The inspection judges talked about each foal's bloodlines and the conformation/movement in a very organized way, so it was a great learning experience. I so appreciate being able to attend these; Rolling Stone Farm staff made everyone feel welcome. In this shot she's in mid-stride and you can't see how far she is off the ground, but she has quite a BOING. She can really power off that hind end. 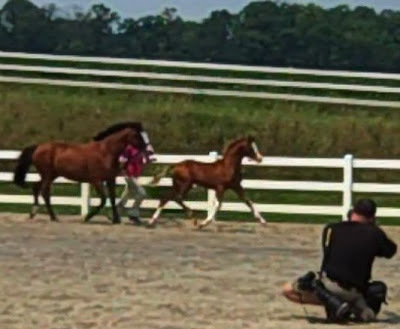 The photo above was taken on practically the first trot step, they hadn't even really started their run -- but look at the elegant frame and lightness of his stride. I assume you've all heard of this foal's dad, Decaprio? This colt's mom was also at last year's inspection and completed the performance test. She really shined (shone?) under saddle both in her movement and in rideability. One of those rich auburn chestnuts, he had a big jump in her too. Rousseau, a Ferro son, is the sire of the top dutch horse Ampere, well-known stallion show champion in Europe. The photo of this colt was taken in a restful moment, but he has a quite a presence and a gorgeous elegant neck. And, here is my personal favorite -- Boot Cut by Black Tie. Pardon the blur, doggoned video, but you can see that freedom of movement (also the first photo left is Boot Cut). Why did I like him the best? I don't know, he was just such a nice overall package--the movement, a pleasant demeanor, and a presence that you can tell will stay with him forever. And okay, the chrome (even a belly splash!). True to his jumping bloodlines, his gaits were ground-covering and elastic, and he effortlessly opened up and compressed his stride. But he lifted through his shoulders too, so maybe he could do dressage, you think? The foal by Rousseau was my personal favorite. He looked like he had a lot of character and presence. He looks like he'll be a gem once he's past the cute awkward yearling stage! And the trot on Boot Cut (?) was amazing!! I've never been to an inspection, but they sound like they'd be interesting to watch. I don't know if we have any in the Central Texas area. I can only dream. Those foals are gorgeous. I do not have the kind of money they will command to buy one, so I will just keep the vision in my head. I'm an Arabian lover through and through -- but these babies are gorgeous. I love Boot Cut - he's so cute and moves so well (in those videos too). Every now and then I really want a baby that has the same bloodlines as my two Hanoverians. Once, I found a 3-year old that was as close to the cross of the two of them as I'll likely ever find, but he had sold. What ever happened to Wanda the hanoverian? Sounds like inspections are fun to watch. I've never seen one. Do you use a Flip? I got one and I noticed the zoom blurred my video. I wondered if I was doing something wrong...? YES, I saw the special memories filly, and if I recall, the inspection officials were delighted with her movement. Did she also have some Abundance in her background? Truly, there were only one or two babies that judges felt was lacking in movement "on that day." They went toward the end of the day and I suspect they were just tuckered out. Hi Stacey. I had my mare there for her Mare Inspection and was not able to stick around to see the babies this year. Thanks for the update. Jenn, your mare was just gorgeous -- congrats on having an EMC!